The J Series is your go to fountain if you are wanting to enhance the class and elegance of your landscape. Each J Series comes with multiple spray nozzles that can be interchanged. The ability to change out the nozzles will give you lots of versatility and you can choose the spray patterns that you like the most. In addition to beautiful spray patterns the fountains will also improve the health of your water with increased oxygen transfer. The Kasco J Series fountains fountains come with a 2 year warranty for 1/2 HP to 1 HP units and a 3 year warranty for all fountains 2 HP and up. 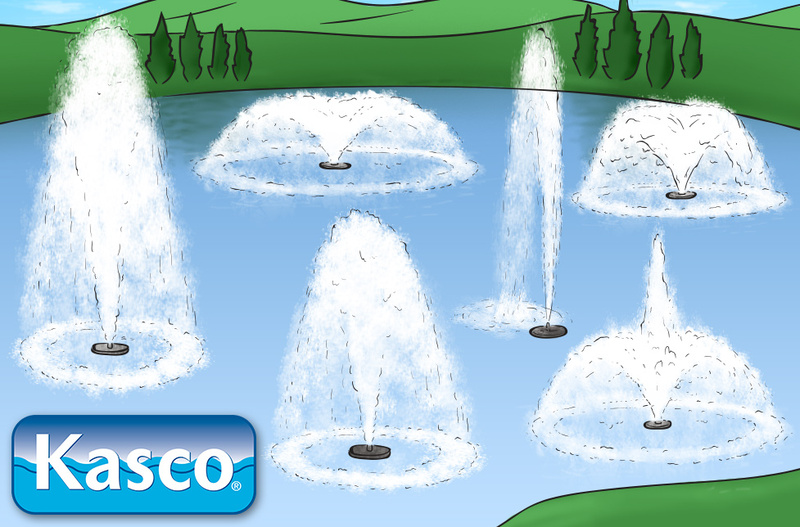 ​The Kasco VFX Series offer more aeration power than the decorative fountains above. They operate at a higher GPM (Gallons per minute) which means you have more water moving and circulating each minute. The VFX only comes with one spray which is referred to as the "V" pattern or "Umbrella" pattern. The nozzle can not be changed. This fountain gives you the best of both worlds, you will have a very decorative spray pattern plus the most aeration power you can get from a fountain. The Kasco VFX fountains come with a 2 year warranty for 1/2 HP to 1 HP units and a 3 year warranty for all fountains 2 HP and up. ​Living Water Aeration is a leading retailer of pond fountains, offering only the top quality in pond fountains and accessories through their online store. Many years of experience with pond fountains has led the company to identify the top brands and products that customers find the most beautiful, the most effective, and the easiest to maintain. Pond fountains are widely used in both commercial and residential landscaping. A commercial pond fountain could be found at a golf course, on the grounds of a country club, in the courtyard of a hotel or corporate headquarters, or in the lake of a resort. Not only do commercial fountains help manage stormwater, commercial pond fountains add value to any property. Residential pond fountains similarly enhance the beauty and value of any residential landscape. They can be found in neighborhood developments and on private property, where homeowners can relax with the tranquil sight and soothing sound of the splashing water. Pond fountains not only add beauty and elegance to a landscape, they are beneficial to the water and the eco-system of the pond itself. Like aeration systems, fountains also introduce oxygen into the water as droplets splash down onto the surface. A fountain can provide sufficient aeration on its own for a small pond. 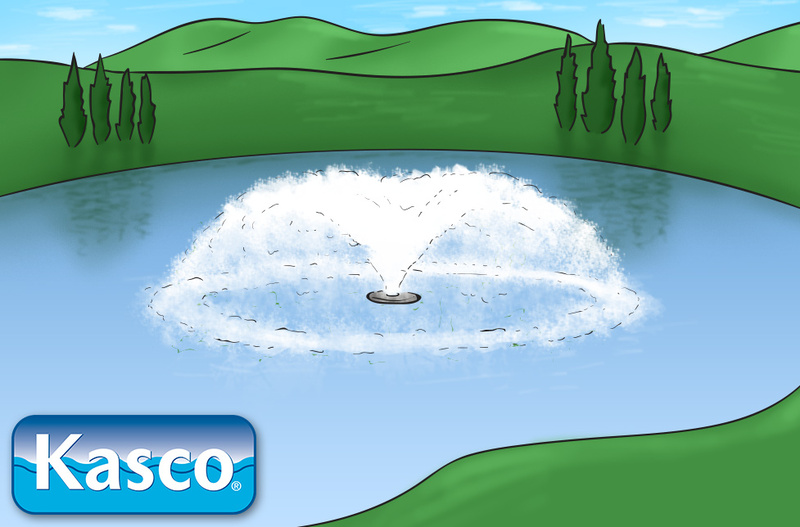 Owners of deep or irregular ponds who need to aerate a large area or multiple areas may find it beneficial to incorporate both a floating fountain in the center of the pond and one or more aeration systems. The following are some of the ways that a pond fountain can improve the quality of water and life in a pond. Improvement of water quality: More and more commercial sites are adding stormwater ponds to their property. These ponds collect run-off from parking lots and high ground, run-off that often contains dirt, debris, and even garbage. In a stagnant pond, these substances settle to the bottom and release gases and metals that contaminate the water. A pond fountain improves the quality of water by de-stratifying the water column as it pulls water into the pump. In addition, the droplets that splash back into the pond contain oxygen, and oxygen-rich water supports the bacteria that biodegrade pond sludge. Decrease in insect populations: Stagnant ponds are the favorite breeding ground for mosquitoes and other insects. With growing insect-related health concerns, like the Zika virus, many pond owners are turning to pond fountains as a means of decreasing or eliminating insect populations. Fountains introduce a constant movement in the water, making it unfriendly to breeding insects. Reduction of algae: The splashing water of a pond fountain forces surface-dwelling algae down below the surface, depriving it of the sunlight it needs to grow. In addition, the extra oxygen introduced by a fountain decreases excess nutrients in the pond, which helps with controlling algae. Improvement in the quality of pond life: Owners of fish ponds often add a fountain not only to beautify the pond but to promote a healthier environment for their fish. One of the biggest dangers for fish is a decrease in the level of dissolved oxygen in pond water. The oxygen introduced by a pond fountain can significantly improve their habitat, making it easier for the fish to survive and thrive. There are many types of pond fountains to choose from. Decorative fountains are selected primarily for their aesthetic appeal, and they come in different sizes, from a few feet high to a dramatic 20 feet or higher above the surface. Decorative fountains often come with interchangeable spray nozzles that create a variety of spray patterns, from starbursts to cascading tiers to a single majestic jet. While the splashing water of a decorative floating fountain provides a degree of valuable surface aeration, the spray of aerating fountains provide more GPM(gallons per minute), meaning higher volume, more splashing and more movement of the water than decorative fountains . Aerating fountains that spray in a v-shaped pattern perform a higher degree of oxygen transfer than decorative fountains and may be a better choice for a large body of water if aeration is a primary goal. Living Water Aeration is proud to offer products from leading manufacturers of pond fountains. Kasco Marine is a Wisconsin-based company that specializes in floating decorative and aerating fountains in addition to other products that promote healthy natural water environments. In business for over 40 years, they continue to grow in popularity. Their products have been best sellers for Living Water Aeration since 2004. Otterbine is another experienced manufacturer of high-quality pond fountains and water aeration systems. Drawing from research in wastewater engineering and lake management, they have developed highly effective aeration systems that are safety-tested and approved. Another company with 40 years of experience, Easypro makes the AquaFountain, a smaller fountain that comes in � HP and 1 HP sizes. These fountains are ideal for customers who want a beautiful fountain for a small pond at a lower cost. The depth, shape, and size of the water feature all have an influence on the choice of fountain. Depth: It is generally recommended that a fountain be used for aeration in water that is less than six feet deep. Since a fountain pulls water from the upper strata of the water column, water below a depth of six feet may not be circulated as well. 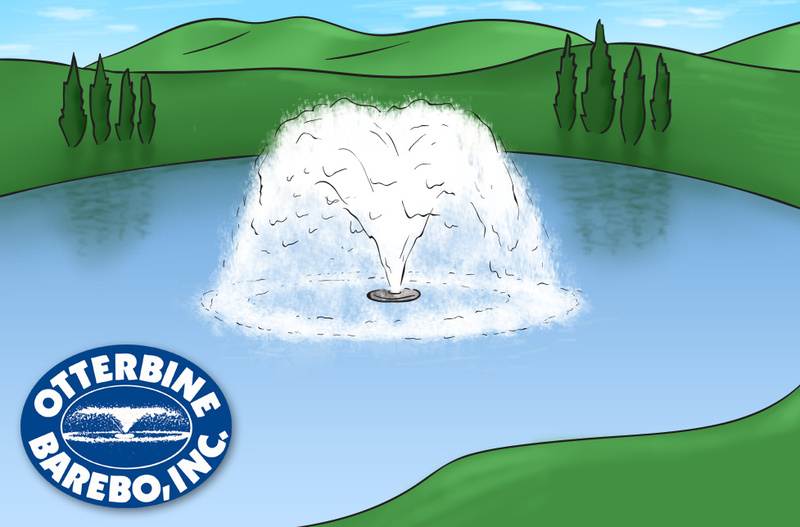 For deeper ponds, subsurface aeration is recommended. Shape: A pond fountain works well to aerate a round pond. However, if a pond has an irregular shape, the water doesn�t circulate as well, and a fountain may not be able to aerate all areas of the pond. In that case, subsurface aerators can be placed in outlying areas. Size: Pond fountains in larger ponds need more powerful motors. 1.5 HP per acre is a good rule of thumb for choosing a motor for an aerating fountain. The size of the pond also determines the height of the spray. A fountain should spray water to a height of no more than half the width of the pond to prevent too much water being removed. Temperature: A fountain is not designed to operate in freezing weather, so experts recommend removing a fountain during the winter to prevent damage from ice. Pond fountain lights are a favorite accessory as they add a lot to the visual appeal of a pond at night. Living Water Aeration offers a variety of lighting kits, available in sets of 2, 3, and 6 light fixtures with waterproof connections. The fixtures come with a choice of colored lenses, and the lights are installed above the surface of the water to light the fountain from below. The following are a couple of things to consider when lighting a water feature. Type of bulb: Living Water Aeration offers LED lights with a variety of colored lens caps. Kasco�s RGB lighting, a new product, has color-changing LED bulbs with the capacity to create nine different colors and three different sequencing patterns. Users can also adjust the brightness of the bulbs. The lighting system is operated by remote control, and it can also be coupled with a music device so that the light sequence changes with the rhythm of the music. Quantity of light: The ideal number of lights will depend on the size of the fountain. Lighting manufacturers recommend a 3 LED light kit for � to 2 HP units, and 6 LED light kits for 2 HP to 7.5 HP units. Using a 6 LED light kit with a 2HP unit will yield a brighter display. In addition to lighting, Living Water Aeration provides other pond accessories, including rocking piston sub surface aeration kits, cleaning supplies, sludge remover, and dye. Living Water Aeration professionals are available to help customers figure out not only which type of fountain is best suited to their pond, but also which accessories will be the most beneficial for their needs. Pond fountains need relatively little maintenance, but owners should be prepared to keep an eye on the pump intake in order to keep it free of leaves and other debris in most ponds clogging is not an issue, the fountains include a grate over the bottom and most small sticks and leaves that get near th motor are pulverized instantly. If the intake gets clogged, the motor could overheat. Excessive mineral buildup can also damage the pump, especially the seals and bearings. Therefore, it�s recommended that the fountain be taken out once per season and flushed with clean water. In cold climates where ponds ice over, as mentioned previously, fountains should be removed for the winter. For further information about choosing, installing, or maintaining pond fountains, contact the experts at Living Water Aeration.